How is it that I'm drowning in work and still make time to sew? That's never happened before. Maybe my sewing mojo was blocked and all the work just hid that fact. Anyway, the recent swimsuit success seems to have really buoyed me, so here we are with another project, again with vacation in mind. Does the bodice style look familiar? It mimics the new-ish (released in May, I think) Hazel pattern by Colette. I'll make the story quick: Sarai from Colette Patterns made this dress in an embroidered fabric and I LOVED the photos she posted on her blog. I got ready to boogie down to The Common Thread to make this pattern mine, but there were a couple hours yet before the shop opened. So I stayed busy reading pattern reviews on this gem. Someone who is on the petite end of the spectrum, very thin, AND wears a C-cup said the top of the dress, in size 0, was still too big for her, and then I knew I would have to drape this one instead of buying the pattern. I made Macaron a couple years back. The fit is OK. I wouldn't call it perfect. I bought Rooibos but you've never seen it on this blog because I can't figure out how to do a good SBA with three bust darts! In my world, there is no need for three bust darts. I could never get the top to look right on me. Beautiful pattern, though. So here we are with Hazel and I just couldn't bring myself to get the pattern and potentially be dumbfounded about how to fit it to me and end up with another pattern minus a dress. Figured I would start from scratch. It really wasn't bad. I used leftovers from a thrifted bed sheet that I used to make a Mociun knock-off long ago to drape the bodice on the form. The fit was easy to drape and then alter so I went to fashion fabric quickly. 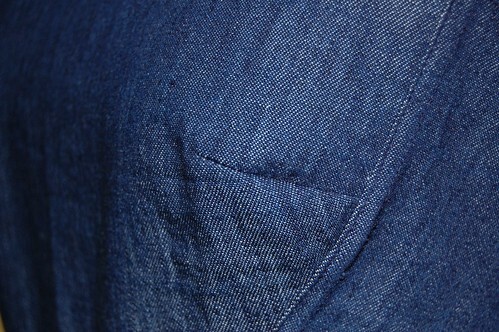 I'm a collector of lightweight denim, and I had two small cuts of dark denim to use. I used one for the top and another for the skirt. And yes, I did flat-felled seams all around the bodice, no lining. My skirt is very different from Hazel's! Did you notice? I have not had great luck gathering denim, even lightweight stuff, so I went in a different direction with a half circle skirt. This gal has a wonderful "cheat sheet" on pattern drafting the various kinds of circle skirts. 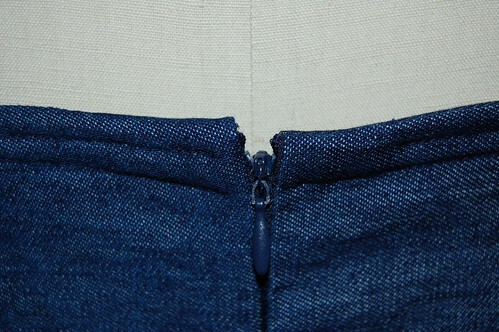 I just measured the bottom of the bodice (27 inches) and used that as my radius in the half circle skirt calculation. Everything was just perfect. 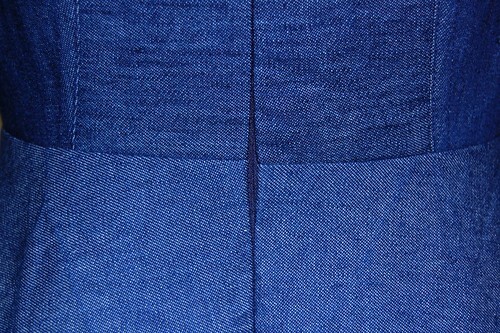 I finished the bottom of the skirt with my handy-dandy 6mm rolled hem foot! Heaven! In reality, on my body? I think my waist is actually 1/2" higher than Clementine's. I will need to adjust for this in the future. My husband keeps harping on me that the bodice is too big, but to me it has wearing ease. Just LOVE this half skirt. I've only ever done full circle skirts in the past but I think half circle is just right for me. I considered putting in welt pockets because I can't imagine everyday life without pockets! Didn't want to affect the drape so no pockets for this dress, I think. Love the 2" wide straps that cover my bra from the front and back. way to go Antoinette!! Good job! 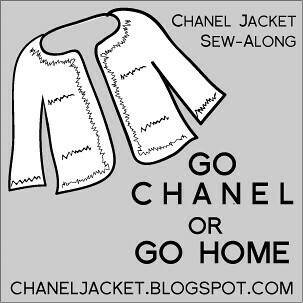 This would be SO cute in a linen or cotton too. Thanks, I will prob. make it again to try to perfect those little fitting issues. I'm a linen-lover and will be on the hunt for the right linen for this. 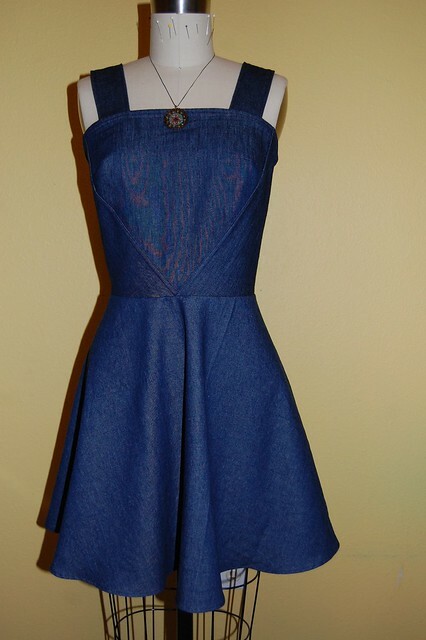 I always love a denim dress and yours is really nice. I experimented with the half circle skirt once when making a dress for TLM - I didn't have wide enough fabric for the skirt pattern piece, so folded it in until it fit! Seriously, I do like your dress and now I want to make one too - but it's mid winter here. 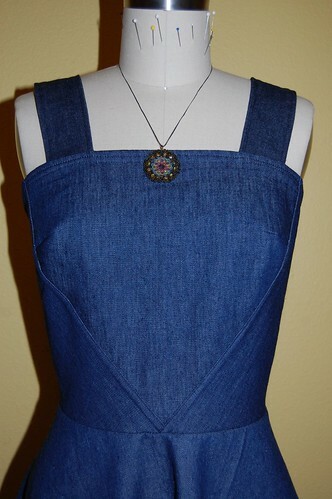 Thank you, I do remember you making a denim dress from recycled denim and I really liked it! This would be a candidate for being made from recycled denim, except for that front piece, which is wide than most pant legs. Maybe grabbing that front piece from a denim jacket would do the trick. Spring will be here before you know it! That is really cute! Great job!! Am digging your resort wear collection!! Looks like you've been doing some fitting work yourself! The dress looks like it'll be a great (and versatile) addition to any collection. The wide straps are a great idea, too. I like the skirt the way you did it. I think it works better with the diagonal seams on the bodice than a gathered skirt would. Kudos on a job well done! Thank you! I'm a big fan of the quarter circle skirt after this project! I love that you're making all this time for sewing! The dress is so cute... a great summer piece. 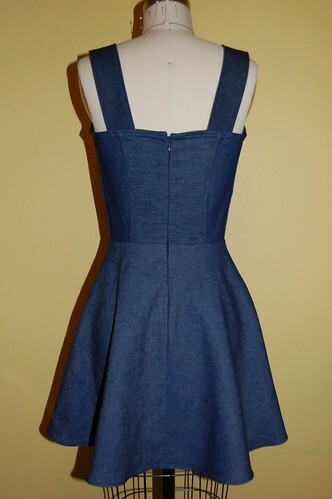 It's actually unusual that such a dress is made out of denim but I like it! AWWW thanks so much for so sweet words about my instagram pics:) It made my day.